October 24, 2018: "UN Day Concert"
In 1948, the United Nations General Assembly declared 24 October, the anniversary of the Charter of the United Nations, as which "shall be devoted to making known to the people of the world the aims and achievements of the United Nations and to gaining their support for" its work. United Nations Day is part of United Nations Week, which runs from 20 to 26 October. Every year the Organization celebrates the 24 October with a special programme. 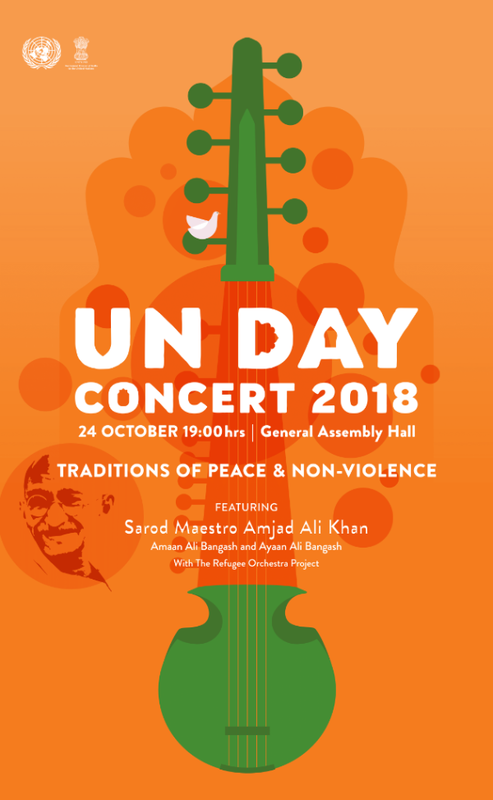 The 2018 UN Day Concert will be held on Wednesday, 24 October 2018 from 7:00 p.m. to 8:30 p.m. in the General Assembly Hall at United Nations Headquarters in New York. It will feature sarod virtuoso Ustad Amjad Ali Khan, who will be accompanied by his sons Amaan Ali Bangash and Ayaan Ali Bangash, and the Refugee Orchestra Project conducted by Lidiya Yankovskaya.